In his 1891 memoirs, ‘Forty Years in a Moorland Parish’, the vicar of Danby, Canon John Atkinson, reflected on how the local farms were “universally small” and scarcely averaged 75 acres apiece. “Danby is a district of smallholdings; and if the greater landlords are wise, it will always remain so,” the clergyman wrote. In the intervening years and up to the modern day, many small family farms may have been squeezed out in a climate of increasingly competitive markets for their produce, but this is still prime North York Moors territory and a place where agriculture will always maintain a grip on local life. One of the area’s smaller farms is a 60-acre concern run by 55-year-old Neil Harland, who grew up here, moved away to pursue a career in electronics engineering but who found his way back to his old stomping ground. The landscapes here lend themselves to upland sheep grazing and lowland cropping and cattle, and the parish’s farming prowess is showcased annually at Danby Show, an event which tends to attract around 6,000 visitors each year. “It’s one of the biggest shows around here. You can’t move in the village the day that it’s on,” Mr Harland said. Cannon Atkinson’s 127-year-old tome may have long been out of print but the story of the people, history, wildlife and landscape of the North York Moors is told to visitors at The Moors National Park Centre on the banks of the River Esk half a mile east of Danby. The former hunting lodge is one of three Dark Sky Discovery locations in the National Park where the skies are dark enough for the Milky Way to be visible to the naked eye and it will play a part in next month’s Dark Skies Festival organised by the Yorkshire Dales and Moors National Parks. 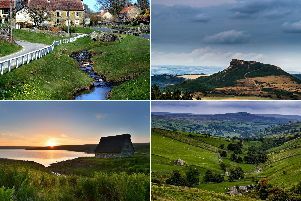 Danby is also prime ‘walking country’ and five circular walking routes are detailed in a booklet available at the National Park Centre and from local shops. One of the walks takes in the early 14th century Danby Castle, now a working farm, and Duck Bridge, a medieval packhorse bridge over the Esk. Local landmark, Danby Beacon is perhaps the finest viewpoint, rising up to 981ft above sea level. Easy get reach, Danby has a train station on the Esk Valley Railway line where services run between Whitby and Middlesbrough. Danby has a pub, the 18th century Duke of Wellington which overlooks the village green. Canon Atkinson served as Danby’s vicar from 1947 and his grave is beside St Hilda’s Church in Danby Dale, about two miles from Danby village. The 158th Danby Show is due to take place this year on Wednesday, August 15 at the showfield half way between the village and nearby Castleton.